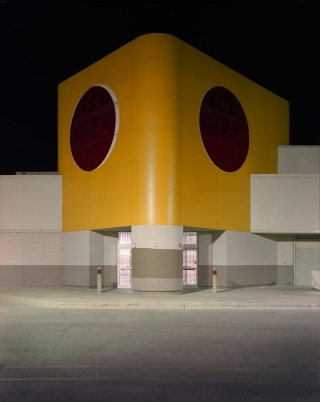 Brian Ulrich examines dominant American consumer culture in his work. Working as a kind of visual anthropologist Ulrich studies the act of shopping, in particular at shopping malls and thrift stores in direct relation to its political, social and cultural implications. This project Ulrich has termed Copia (Latin, plentiful supply, abundance). He often works as part of the group of „Chicagraphers" with fellow artists Jon Gitelson and Matt Siber, who are also represented by Galerie f5,6. This loose grouping, without a radical political manifesto of an artist's group such as DADA, ZERO, the Blue Rider, the Surrealists, the Minimalists etc. of the last Century, simply states „A small sampling of the many good talents in our city by the lake". All artists incorporate new media ,in particular, the web and within this the blog into their projects. „In 2001 citizens were encouraged to take to the malls to boost the U.S. economy through shopping, thereby equating consumerism with patriotism. The Copia project, a direct response to that advice, is a long-term photographic examination of the peculiarities and complexities of the consumer-dominated culture in which we live. Through large scale photographs taken within both the big-box retail stores, and the thrift shops that house our recycled goods, Copia explores not only the everyday activities of shopping, but the economic, cultural, social, and political implications of commercialism and the roles we play in self-destruction, over consumption, and as targets of marketing and advertising. By scrutinizing these rituals and their environments." (From a statement byBrian Ulrich). An Army of Consumers; excerpt from an essay by Natasha Egan (Associate Director Museum of Photography, Columbia College Chicago), MP3, Copia, Brian Ulrich, Aperture Foundation.